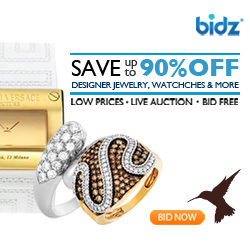 Bidz.com is a great place to get name brand jewelry and accessories for insanely low prices. Sign up for free with your email and start bidding on top brands like Aquaswiss, Hello Kitty, Tiffany & Co. and more! Utilize the “Buy Now” option and get free shipping on your order. Sign up today to check it out!